Day set aside by tradition for fasting and mourning, to commemorate the destruction of Jerusalem and the Temple by the Chaldeans (586 B.C.) and by the Romans (70); a movable fast falling approximately in the beginning of August of the Gregorian calendar. In II Kings, xxv. 8, 9 it is stated that the Temple was burned on the seventh day of the fifth month; in Jer. xxxix. 8 no exact date is given; while in Jer. lii. 12 the tenth day of the fifth month is assigned as the date. In connection with the fall of Jerusalem three other fast-days were established at the same time as the Ninth Day of Ab: these were the Tenth of Tebet, when the siege began; the Seventeenth of Tammuz, when the first breach was made in the wall; and the Third of Tishri, the day when Gedaliah was assassinated (II Kings, xxv. 25; Jer. xli. 2). From Zech. vii. 5, viii. 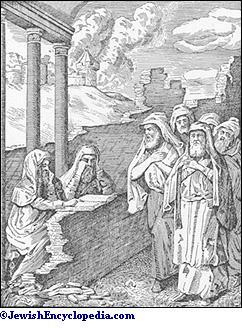 19 it appears that after the erection of the Second Temple the custom of keeping these fast-days was discontinued. 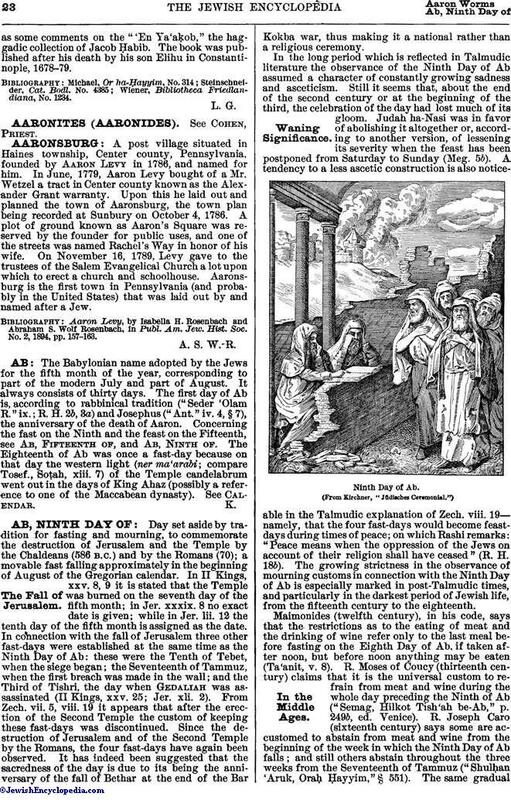 Since the destruction of Jerusalem and of the Second Temple by the Romans, the four fast-days have again been observed. It has indeed been suggested that the sacredness of the day is due to its being the anniversary of the fall of Bethar at the end of the Bar Kokba war, thus making it a national rather than a religious ceremony. 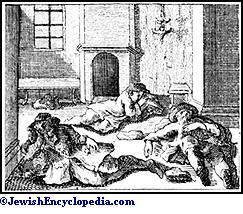 In the long period which is reflected in Talmudic literature the observance of the Ninth Day of Ab assumed a character of constantly growing sadness and asceticism. Still it seems that, about the end of the second century or at the beginning of the third, the celebration of the day had lost much of its gloom. Judah ha-Nasi was in favor of abolishing it altogether or, according to another version, of lessening its severity when the feast has been postponed from Saturday to Sunday (Meg. 5b). A tendency to a less ascetic construction is also noticeable in the Talmudic explanation of Zech. viii. 19—namely, that the four fast-days would become feast-days during times of peace; on which Rashi remarks: "Peace means when the oppression of the Jews on account of their religion shall have ceased" (R. H. 18b). The growing strictness in the observance of mourning customs in connection with the Ninth Day of Ab is especially marked in post-Talmudic times, and particularly in the darkest period of Jewish life, from the fifteenth century to the eighteenth. (From Kirchner, "Jüdisches Ceremonial. ")In the Middle Ages. Maimonides (twelfth century), in his code, says that the restrictions as to the eating of meat and the drinking of wine refer only to the last meal before fasting on the Eighth Day of Ab, if taken after noon, but before noon anything may be eaten (Ta'anit, v. 8). R. Moses of Coucy (thirteenth century) claims that it is the universal custom to refrain from meat and wine during the whole day preceding the Ninth of Ab ("Semag, Hilkot Tish'ah be-Ab," p. 249b, ed. Venice). 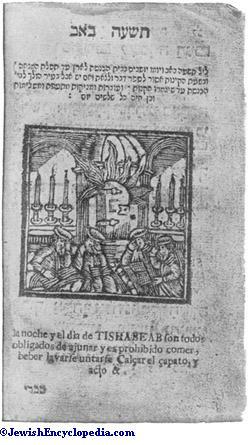 R. Joseph Caro (sixteenth century) says some are accustomed to abstain from meat and wine from the beginning of the week in which the Ninth Day of Ab falls; and still others abstain throughout the three weeks from the Seventeenth of Tammuz ("Shulḥan 'Aruk, Oraḥ Ḥayyim," § 551). The same gradualextension can be traced in the abstention from marrying at this season (ib. § 551, 2d annotation by R. Moses Isserles) and in other signs of mourning. So R. Moses of Coucy says that some do not use the phylacteries on the Ninth Day of Ab ("Semag," p. 249c), a custom which later was universally observed. In this manner all customs originally designated as marks of unusual piety finally became the rule for all. Shabbethai Ẓebi abolished the Ninth of Ab in view of the same rabbinical legend [and the women in the East anoint themselves in the afternoon, because the Messiah is to be born on this day—L. G.]. In the liturgy the Book of Lamentations was, through many centuries, recited at the initiatory evening service. "The sorrow for departed glory would probably have been satisfied with these Biblical chapters if new sufferings had not constantly caused the production of fresh plaints" (Zunz, "Ritus," p. 88). Finally, the collection of plaintive songs (Ḳinot) for the day was expanded into an entire volume. Some of these songs are of superior poetic beauty and full of the finest religious sentiment; especially the ode to Zion by Judah ha-Levi. The best of the ḳinot were translated by Mrs. H. Lucas in "Jew. Quart. Rev." 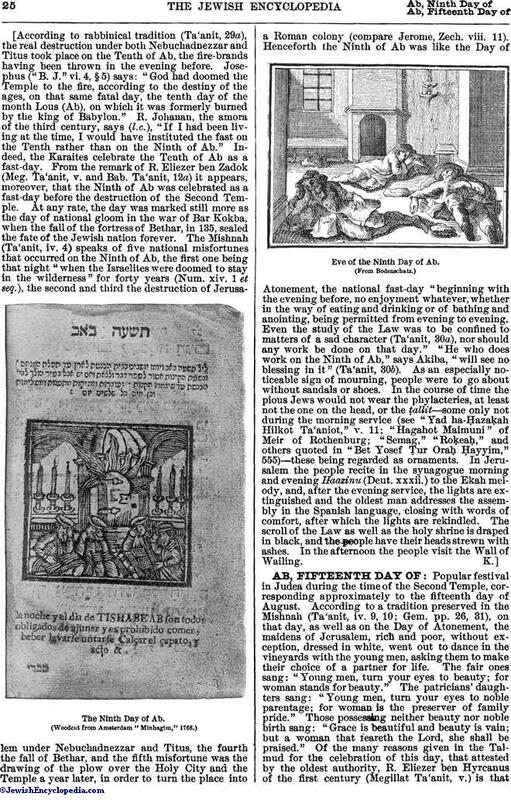 v. 652, and were reprinted in "The Jewish Year," p. 129; also by Edward G. King in "Jew. Quart. Rev." vii. 464. As long as the Jews were everywhere regarded as strangers and treated as such, the rights of citizenship being denied them, it was but natural that the Ninth Day of Ab should be observed as a day of deep mourning, and that the season leading up to it should be full of gloom. But even then confidence in the help of God and in the final victory of justice and truth was never lost; and the Sabbath immediately following this day was called "Sabbath of Comfort" (Shabbat Naḥmu), because the comforting message from Isa. xl., beginning with the words "Naḥmu, naḥmu," etc. (Comfort ye, comfort ye, etc. 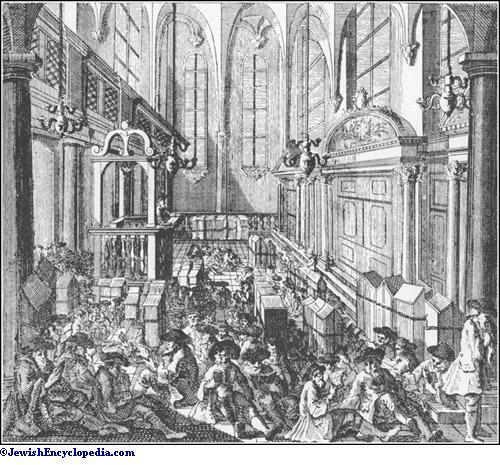 ), was then read in the synagogues. Synagogue Service on the Ninth Day of Ab. (From Bodenschatz, "Kirchliche Verfassung. ")Reform View. "Reformed Judaism beholds in the cessation of the sacrificial service the termination of a special nationality and the scattering of the Jews among all nations the fundamental conditions for the fulfilment of their mission among mankind. 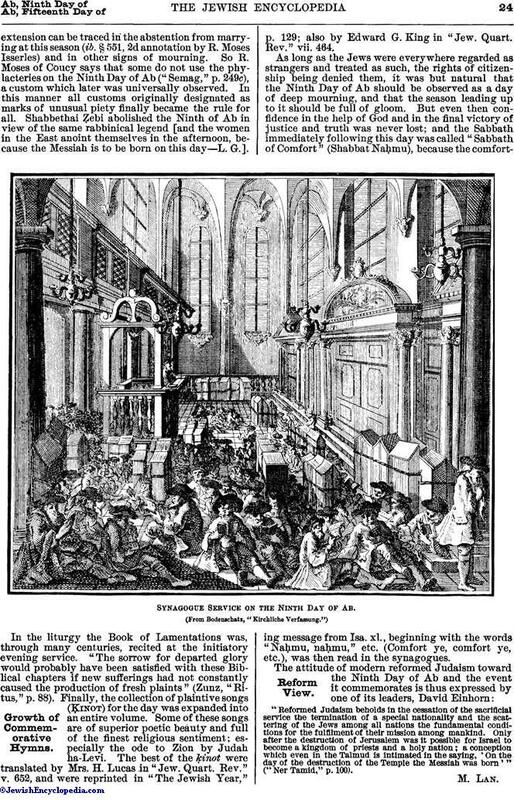 Only after the destruction of Jerusalem was it possible for Israel to become a kingdom of priests and a holy nation; a conception which even in the Talmud is intimated in the saying, 'On the day of the destruction of the Temple the Messiah was born'"
[According to rabbinical tradition (Ta'anit, 29a), the real destruction under both Nebuchadnezzar and Titus took place on the Tenth of Ab, the fire-brands having been thrown in the evening before. Josephus ("B. J." vi. 4, § 5) says: "God had doomed the Temple to the fire, according to the destiny of the ages, on that same fatal day, the tenth day of the month Lous (Ab), on which it was formerly burned by the king of Babylon." R. Johanan, the amora of the third century, says (l.c. ), "If I had been living at the time, I would have instituted the fast on the Tenth rather than on the Ninth of Ab." Indeed, the Karaites celebrate the Tenth of Ab as a fast-day. From the remark of R. Eliezer ben Zadok (Meg. Ta'anit, v. and Bab. Ta'anit, 12a) it appears, moreover, that the Ninth of Ab was celebrated as a fast-day before the destruction of the Second Temple. At any rate, the day was marked still more as the day of national gloom in the war of Bar Kokba, when the fall of the fortress of Bethar, in 135, sealed the fate of the Jewish nation forever. The Mishnah (Ta'anit, iv. 4) speaks of five national misfortunes that occurred on the Ninth of Ab, the first one being that night "when the Israelites were doomed to stay in the wilderness" for forty years (Num. xiv. 1 et seq. ), the second and third the destruction of Jerusalem under Nebuchadnezzar and Titus, the fourth the fall of Bethar, and the fifth misfortune was the drawing of the plow over the Holy City and the Temple a year later, in order to turn the place into a Roman colony (compare Jerome, Zech. viii. 11). Henceforth the Ninth of Ab was like the Day of Atonement, the national fast-day "beginning with the evening before, no enjoyment whatever, whether in the way of eating and drinking or of bathing and anointing, being permitted from evening to evening. Even the study of the Law was to be confined to matters of a sad character (Ta'anit, 30a), nor should any work be done on that day." "He who does work on the Ninth of Ab," says Akiba, "will see no blessing in it" (Ta'anit, 30b). As an especially noticeable sign of mourning, people were to go about without sandals or shoes. In the course of time the pious Jews would not wear the phylacteries, at least not the one on the head, or the ṭallit—some only not during the morning service (see "Yad ha-Ḥazaḳah Hilkot Ta'aniot," v. 11; "Hagahot Maimuni" of Meir of Rothenburg; "Semag," "Roḳeaḥ," and others quoted in "Bet Yosef Ṭur Oraḥ Ḥayyim," 555)—these being regarded as ornaments. In Jerusalem the people recite in the synagogue morning and evening Haazinu (Deut. xxxii.) to the Ekah melody, and, after the evening service, the lights are extinguished and the oldest man addresses the assembly in the Spanish language, closing with words of comfort, after which the lights are rekindled. The scroll of the Law as well as the holy shrine is draped in black, and the people have their heads strewn with ashes. In the afternoon the people visit the Wall of Wailing. The Ninth Day of Ab. Eve of the Ninth Day of Ab.